New evidence discovered by NASA's Curiosity Rover suggests Mars was once covered in water that may have been fit for humans to drink. During recent sessions at the European Planetary Science Congress, scientists presented many details that corroborate previous findings of water once existing on the Martian planet. Earlier this year, Curiosity analyzed samples that suggested Mars could have supported microbial life. Speaking during one of the sessions, which were held between Sept. 8 and Sept. 13, Melissa Rice, of the California Institute of Technology in Pasadena, said Curiosity's Mastcam instrument found what scientists interpret to be a "habitable environment." "We know that we had an initial habitable environment when these rocks formed, and then sometime later—we don't know when—these rocks had water flowing through them, through these fractures, leaving calcium sulfate behind," Rice said. Rice also explained that findings suggest Mars went through at least two wet stages, but scientists are unsure of the era when rocks formed was actually habitable. 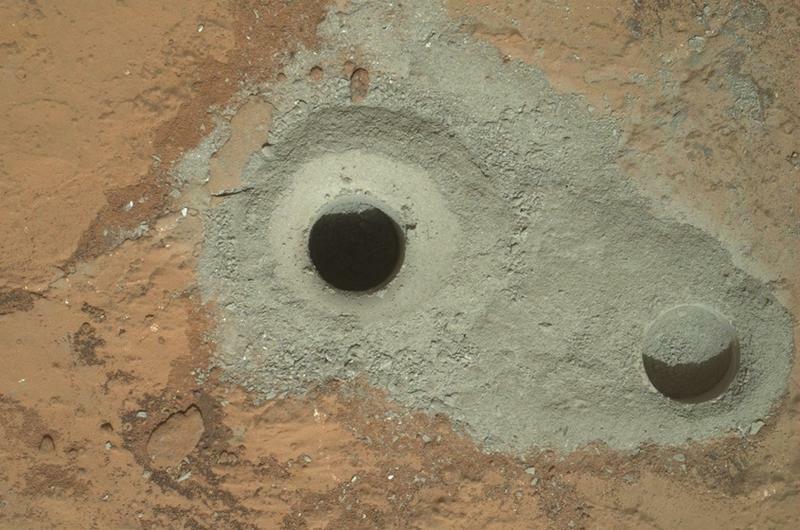 Perhaps the most significant find came when Curiosity drilled into Mars' surface, finding clay minerals that hint at either formation in or alteration by water on Mars. NASA's other rovers, Spirit and Opportunity, found signs of water way back in 2004, but much of it was considered highly acidic; the evidence found by Curiosity is apparently neutral and benign, hence the suggestion that it may have even been safe for human consumption. Another huge piece of evidence backing up Curiosity findings was a small pebble the rover accidentally drove over, which revealed a snowy-white interior, leading scientists to believe the presence of hydrated minerals formed at some point throughout Mars' history. There's been plenty of other evidence, too, and seemingly every new analysis and discovery suggests water was once very presence on the Red Planet. Curiosity is currently on its way to Mount Sharp, where scientists are hoping to do more analysis on the mountain's base. Given what's been discovered thus far, scientists are hopeful the best is yet to come. "It's only going to get better," said one scientist.